In 1997, the team had a surprising 88 win season with young players like Edgardo Alfonzo beginning to make his mark, accomplished players like John Olerud rejuvenating their careers, and players like Rick Reed seemingly coming out of nowhere to be good Major League players. With a brash Bobby Valentine at the helm, many expected the Mets to make the leap in 1998. As the 1998 season unfolded, it wasn’t to be, and that was mainly because their star catcher Todd Hundley had offseason elbow surgery which was going to keep him out for a while. The Mets did start well. On May 13th, the Mets were 19-15, albeit seven games back in the division. Then, the following day, shockwaves went through Major League Baseball, and not just because the Mets were swept in a doubleheader by the Padres. No, out of nowhere Mike Piazza was traded to the Florida Marlins. It was an absolute blockbuster with Piazza and Todd Zeile going to the Marlins, who just dismantled the 1997 World Series winning team, for Manuel Barrios, Bobby Bonilla, Jim Eisenreich, Charles Johnson, and Gary Sheffield. Everyone in baseball knew the Marlins were looking to flip Piazza for prospects, and a talented Mets farm system seemed to make them one of the favorites if they were interested. Problem was, they weren’t interested. After this trade happened, the Mets would fall to nine games out in the division. While this was happening, Mike and the Mad Dog would take to the air day-in and day-out clamoring for the Mets to go out and get Piazza. Their assault was relentless. While a noted blowhard, you can never discount how public pressure forces teams to act. After all if we look back to 2015, with all that happened, we did see the Mets swing a trade to obtain Yoenis Cespedes. The public pressure continued in the ensuring offseason with the team, who had already moved on from Cespedes by signing Alejandro De Aza to platoon with Juan Lagares in center, acquiescing and signing Cespedes to what was essentially a one year deal. The team didn’t let things play out after the 2016 season. They jumped fairly quickly, and they signed Cespedes to a four year deal even with full knowledge of his heel issues. Certainly, much of this was the result of the public pressure, which was given a voice on New York airwaves by people like Francesca. Now? Well, Francesca has gone from being an important voice to being a mouthpiece for the Wilpons. He is now defending the Wilpons saying they are spending money. He notes how the team has the seventh highest payroll in the majors. That is patently false. Cots, Spotrac and Steve the Ump ranks the Mets payroll 12th. Really, everyone ranks the Mets payroll 12th. The AP ranked the Yankees, not the Mets as having the seventh highest payroll. Maybe, Francesca read New York and was confused. Putting the ranking aside, lost in that is the Mets recover 75% of David Wright‘s salary, which, according to Anthony DiComo of MLB.com, Jeff Wilpon has admitted does not get reinvested into baseball operations. That means the Mets payroll is actually $15 million less than advertised. Dropping the Mets payroll by $15 million, the Mets payroll drops to 15th in the majors. With the $3 million saved in the Jeurys Familia trade, the payroll drops to 16th. Yes, a New York market team, who is currently refusing to give Jacob deGrom, currently the best starter in baseball, a contract extension, is in the bottom half of the league in spending. For his part, Francesca defends this. He will say the Mets spend, but they don’t spend well. Nothing backs this up remotely. Nothing. Instead of pointing the finger where it belongs, the Wilpons, he will continue to bash Mickey Callaway as if he is the scourge of the Mets organization. He will look at all the surrounds the Mets and mock them while failing to even consider pointing the blame at ownership. And for all that, I’ve stopped listening to him. After over 30 years of listening to him, I’m done. And I suspect I will not be the only Mets fan who feels this way. Arguably, this was the most entertaining All Star Game in quite a while. It was not only a close game which went into extra innings, but we got to know more about some of the best players in the game. Certainly, miking Mike Trout, Bryce Harper, and Francisco Lindor made them much more likeable and did a great job of promoting the young superstar talent in the majors. They should find a way to show Brandon Nimmo on screen for 100 percent of the telecast. Nimmo watching himself watching the game, Nimmo petting a dog, Nimmo studying film. Any of those really, on the lower right hand corner of the screen. The losers of that year’s All Star Game each pay a portion of the money Bobby Bonilla is owed that year. Get rid of interleague play. That’s if you want to save the All Star Game as is. If not, then scrap the whole thing and just have a season break every four years and make it the World Baseball Classic Semifinals and Finals. If you want to do something the other three years, make it a similar international theme. MLB vs. Cuba. Give each league a 41-man roster. I was gonna say 40, but 41 will be a subliminal advertisement for the greatness of Seaver. All snubs will be solved up to the 42nd-most deserving NL and AL player. What’s a couple of more minutes of introductions? Those are the best parts of the whole affair. Also, get rid of Joe Buck and don’t let Matt Vasgersian near the All-Star Game. Team a really good National League announcer with a really good American League announcer. I’d even accept a blending of the defending league champion crews, understanding we might get stuck with somebody from YES one future midsummer night. If we are going to have every team represented in the All Star Game under the pretext that it generates fan enthusiasm for the event, let the fans pick their All Star. As a Mets fan in 1995, I would have been much more interested in seeing Rico Brogna, Todd Hundley, or John Franco than seeing Bobby Bonilla, which was just further punishment for Mets fans. Seriously, let the fans pick who they want to see – pitchers included. In addition to wanting to see fans pick their own All Star, I also want everyone visiting the site to read the All Star quality material produced by the people who participate in these roundtables. I’m Phil Kerpen, a DC political/policy guy, and I tweet about that and Mets stuff which is kind of a weird mix but some people seem to like it. I grew up in Brooklyn, but I’ve been in Washington for almost 20 years now. I’ve got four kids and the oldest is six so our house is a pretty busy, but I still try to watch most of the Mets games MLB TV is so great. I still remember listening to strained WFAN signals but these days being a fan in a different city is pretty easy. The first few years after the Expos moved here were pretty great — I got to see the Mets in person for nine games a year, and Mets fans pretty much dominated the sparse crowds at RFK. It’s different now as the Nationals have developed a fan base, but there’s always still a decent Mets contingent here. Dwight Gooden was my guy as a kid (my brother was a massive Darryl Strawberry fan), so I guess I’d go with him. For a long time, my automatic answer would have been Todd Hundley, but after the Mitchell Report, he’s disqualified. Yoenis Cespedes is my favorite current Met. Hope he brings back his custom walk-up song “The Power” this year — it’s the best. Can’t top “Little roller up along first,” but the other big one for me personally was the Dave Mlicki shutout at Yankee Stadium in 97. It was about a month after my 18th birthday, and I went with my little brother. Nonstop trash talk with the Yankees fans, and Mlicki was in and out of trouble every inning but somehow managed to pull it off. This team is hot garbage. OF Wilmer Flores? Why Not? When it was announced the Mets were going to try Wilmer Flores in the outfield, it was met with a collective groan from Mets fans. That shouldn’t be surprising as Wilmer has established himself to be not exactly fleet of foot, nor has he shown himself to be a great defender anywhere the Mets have dared to put him. As a result, Mets fans were reminded of the horrors of watching Lucas Duda, Daniel Murphy, and Todd Hundley in the outfield. With injuries to Juan Lagares and Jay Bruce this Spring, we are a step closer to seeing that happen. Given this being Spring Training, and with the Mets health perpetually being what it is, this is exactly the time of year you are supposed to be experimenting with these types of moves. Maybe, just maybe, Flores could handle the position. Let’s start with the obvious – Wilmer is slow. That is something not just proved by the eye test but also by Statcast data. As published on Baseball Savant, Flores had a sprint speed of 25.7 feet per second. To put that in perspective, Flores ranked 398th out of the 451 MLB players ranked. While this isn’t surprising, it is surprising Flores was ranked ahead of two outfielders – Jose Bautista and Matt Kemp. Now, no one should consider Bautista or Kemp good fielders anymore. Last year, Bautista posted a -8 DRS in 1,242.2 innings in right, and Kemp posted a -17 DRS in 851.2 innings in left. Using Fangraphs parameters, that puts Bautista and Kemp in the poor to awful range. Judging from Kemp and Bautista, Flores ceiling in the outfield is probably being a poor outfielder. As Mets fans, we already have that expectation no matter where Flores plays. Last season, he had a -14 DRS. Being a versatile and poor fielder is kind of Flores’ thing. However, unlike Kemp and Bautista, we shouldn’t expect to see Flores spend the majority of his time in the outfield. Basically, what is instructive is Flores is just fast enough to fake it in the outfield. However, the issues is whether he can field enough out there. Really, when it comes to Wilmer his defensive issues have typically been range and arm. That’s a big reason why he didn’t work at shortstop and why he has shown himself to be a poor fit at third. Again, as noted throughout his career, he’s not a real fit anywhere. Really, it could be he’s as poor a fit in the outfield as he is in the infield, so why not? If he’s hitting, they are going to want to find a spot for him in the lineup. If this team repeats their injury issues from last season, and 2018 has not gotten off to a great start, the team may be forced to put him out there. At a minimum, you’d be hard pressed to argue he could be any worse out there. With the Mets trading Lucas Duda to the Tampa Bay Rays, we bring an end to the Mets career of one of the better Mets in their history, and we also see the beginning of the end of an era of Mets baseball. Duda was a player with a promising bat the Mets that first Omar then Sandy tried to get into the lineup. With players blocking his path to his natural first base position, Duda would be moved to the outfield. Duda would be standing there ins what was then a fairly cavernous right field when Johan Santana threw the first no-hitter in Mets history. Lost in that game was Duda homering in the sixth to put the game away. Despite Duda being in the outfield during one of the biggest moments in Mets history, it became increasingly clear he wasn’t an outfielder. He belonged at first base. The fact he even forced a competition for the spot with Ike Davis was impressive. Duda did all he could to wrestle that spot from Davis, and he finally showed the Mets what he could do hitting 30 home runs in 2014. He had more in store in 2015. In that pivotal series that saw the Mets go from second to first place, Duda was 8-9 with a double, three homers, and five RBI. With Mets fans debate over whether Duda was clutch or not, this series should answer the question in the affirmative. These are many of the many great things Duda has done in a Mets uniform. He was the second Mets player in history to hit three home runs in a game at home. Shockingly, he was second to Kirk Nieuwenhuis. Speaking of homering at Citi Field, Duda leaves the Mets as the all-time leader in home runs at Citi Field. Hitting homers was one of the things Duda did well. This year, he passed notable Mets like Edgardo Alfonzo, Kevin McReynolds, and Todd Hundley to finish his Mets career with the seventh most in Mets history. Depending on whether you view Dave Kingman as an outfielder or first baseman, Duda’s 125 Mets homers are either the most or second most for a Mets first baseman. 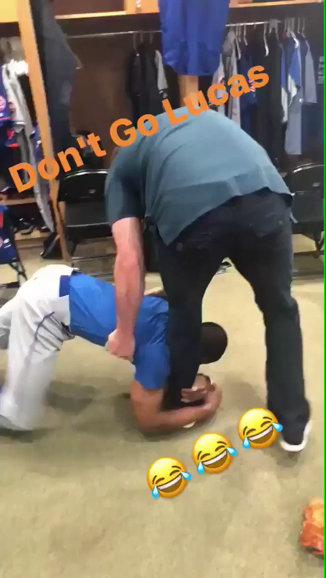 There were many great moments with Duda, but none of the aforementioned moments were my favorite. 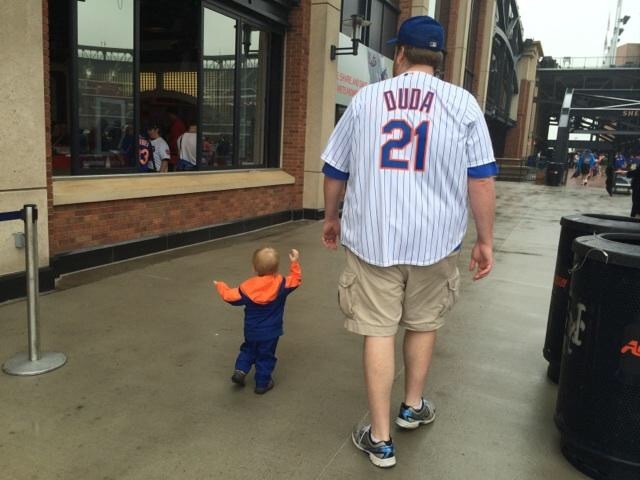 My favorite Duda moment was a seemingly meaningless Spring Training Game in 2015. Duda leaving does not only mean we are saying good bye to a good player who began his career with the Mets. We are also saying good-bye to a part of a Mets era. It was an era that saw the Mets go from a frustrating team a team that came so close to winning a World Series. On a personal note, I see Duda leaving as part of the ever changing realization that my son is no longer a baby – he’s now a little boy. He doesn’t just snuggle up with me at bedtime trying to watch Mets games, he now goes outside and plays baseball with me. Like Granderson, I still want to hold on to not just Duda, but all of these memories. In reality, it’s time to move on to bigger and better things. With that said, I enjoyed each and every minute Duda was a Met (except for that throw), and I appreciate all he has done in a Mets uniform. He was a class act, who was always there to answer questions in even the hardest of times. On a personal note, he helped make another great fan. He deserves another opportunity to win a World Series, and I hope he does get that ring.